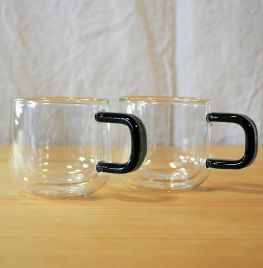 Set of 2 Double Wall Insulated Glass Espresso Mugs. Handmade from Ravenhead with skillful glassblowing techniques - made from ultra-light and heat resistant borosilicate glass. An insulated air pocket lies between the inner and outer glass layers - keeping hot liquids hotter, or cold liquids colder. The outside of the mug remains cool to touch largely unaffected by the temperature of the liquid in the mug.